Now that the festive season is officially over, we’re pretty sure that you’re happy to come home to a somewhat organised kitchen and fridge, and less dishes in the sink (adds a skip in your step). During the holiday season, we tend to indulge in all sorts of delicious foods and mouth-watering puddings. Although you may have satisfied your loved one by serving their favourite apple cream pie or you surprised your mother in law with her favourite Malva pudding. By the time January hits you are all sweetened out and perhaps ready to try something out of the ordinary! We have found the perfect recipe that will keep your friends and family asking for more! Ditch the rice, coleslaw salad and turkey this year and try your hand at some Jeqe also known as Zulu steamed bread, which can be served with some Mutton curry. Our Culinary Arts graduate, Samkelo Mbatha has kindly shared the recipes that you can use to recreate the dishes at home. 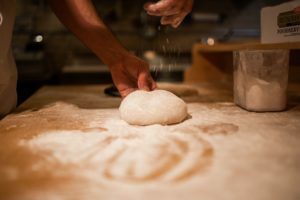 Using your hands, knead the dough. If you have a kitchen aid mixer then you can also use that. You will first need to mix all the dry ingredients and then add the wet ingredients. Mix them together at a low speed or knead at moderate. Once it’s all combined, if you were using a mixer then transfer everything to a dry board. Once that is done you will need to knead it so that it forms a ball. Grab a middle sized metal bowl and oil it. Another option is to the bowl with baking paper. Then in a large pot, add about 2 litres of water and then place the prepared dough along with the large bowl in the pot. Cover it and cook it at a low heat for about 1 hour and a half. To check if the Jeqe is cooked, you will need to insert a skewer or knife. If it comes out clean then it’s cooked. Then you will need to heat the oil and add the diced onions, cloves, and cinnamon sticks. Add the masala powder mix and then meat, then stir it. Add salt, garlic, ginger and then curry leaves. Stir all the ingredients together. Allow it to cook on high heat for about 5 minutes. Reduce to medium heat on stove and continue cooking for about 30 minutes. As the excess water and juices evaporate, add additional water followed by the tomato can. Allow all the ingredients to combine. This should take an additional 10 minutes. Allow it to simmer on high heat for about 5 minutes. If you have a passion for creating beautiful flavoursome dishes, and you’ve been dubbed “MasterChef” by your family. Then we suggest that you look at our Culinary Programmes and speak to our consultants so that you choose a course that will enhance those skills and develop your future chef career.